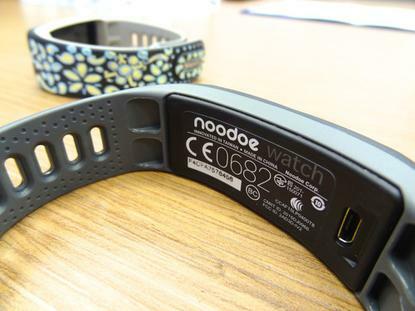 For a smartwatch -- if you want to call it that -- the Noodoe is pretty dumb. It relays smartphone alerts, tells the time... and that's about it. What it does offer is a way to reimagine how to tell the time. Under development by a Taipei startup, Noodoe can display original watch face designs that users draw on paper and upload to the device via a camera app, which has just been uploaded to Google Play. At a demo held on the fringes of the Computex tech expo on Tuesday, a series of snakes drawn in a rectangle that was printed on a sheet of paper were captured with a smartphone camera, edited in the Noodoe app, and then transferred to the device itself via Bluetooth. As the seconds ticked by, the snake illustration scrolled across the watch face. With a flick of the wrist, the watch then showed icons representing the latest message or calendar alerts from the smartphone as well as the time displayed in standard numerals. The same motion is the basic user interface for the device, and was also used to silence the phone when it rang. The Noodoe will be released this year for under US$100. While it looks like a slightly bulky fitness band, it lacks sensors that can monitor heart rate or steps. Its screen is a far cry from the eye-popping displays on deluxe wrist computers such as the Apple Watch. The Noodoe display is monochrome, only readable when illuminated, and low resolution -- it's a 32 by 128 pixel AMOLED, or active-matrix organic LED -- but it's useful enough for the watch's basic functions. Where the Noodoe may shine in comparison to rivals in the increasingly crowded smartwatch field, however, is usage time. Noodoe founder John Wang, a former HTC executive, said that while the specs have not been finalized, the device need only be recharged once every few days, or even once a week. That gives it longer between charges than smartwatches such as the Asus ZenWatch 2, which has a four-day battery. The Noodoe runs on a custom-built, bare-bones platform called Noodoe Core that is thousands of times smaller, in terms of footprint, than Android Wear. Its microcontroller usage is one-thirtieth that of a typical processor running Android Wear and its RAM use is one-eight thousandth. The tradeoff, of course, is that Noodoe cannot play videos or do many of the other smartphone-like functions of sophisticated wearables. For most users, though, the Noodoe appeal will be designing unique ways to display the time, whether it be with illustrations of the faces of dice, playing cards or circles with dots in them to mark the positions of the hour and minute hands of a traditional watch. One design by Wang shows a low-res version of the iconic Taipei 101 building lighting up as the seconds progress, and then little fireworks as each minute passes. The Noodoe's stripped-down, customizable interpretation of the smartwatch reflects a product philosophy that the company is trying to position as the opposite of the Apple Watch and other high-end wearables. "In many ways, Noodoe is a lot closer to Swatch in terms of self-expression and is a lot closer to Lego in terms of using your own ideas," Wang said. The Noodoe is slated for release in the fourth quarter of this year, and an iOS version of the app will soon be released, according to the company.